This is the free web edition of a textbook originally published in print form in 2001, which is still available to purchase in hard copy (paperback only). This book studies some of the key issues in bringing a new food product to a successful commercial conclusion in the marketplace, and outlines the methods of managing them. The authors, Mary Earle, Richard Earle and Allan Anderson, with the kind permission of the copyright holder Woodhead Publishing, give permission to download and print any part or all of the text for any non-profit purposes. Content can be printed by individual page, or as complete Chapters. Funding, publication and hosting for the book is provided by the New Zealand Institute of Food Science & Technology (NZIFST). This online edition was prepared by Chris Newey and edited by Owen McCarthy. 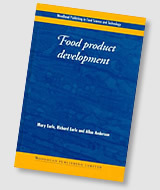 The Web Edition of Food Product Development is given by Richard and Mary Earle, and Allan Anderson, with the support of the NZIFST, as a service to education in food technology, and to the wider food industry. BROWSE each Chapter page by page. SEARCH for words and phrases using the in-site search box. DOWNLOAD or PRINT a whole Chapter at a time, or individual pages, via the Chapter PDF file. Use the 'Print' button at the top of the Adobe Acrobat Reader window (print all, or select the page range). N.B. Pages are numbered as per the original book, not by Chapter. N.B. Copyright permission is given free to reproduce these pages FOR NON-COMMERCIAL PURPOSES, subject to acknowledgement of the source.